This is an original design created from several photos taken while in Sedona, AZ. It measures 34 x 54 inches long ( 86 x 137 cm). The wedding urn has a ring of turquoise stones, and both the urn and cactus are offset on the frame of the piece, supported with a flexible plastic material inside. 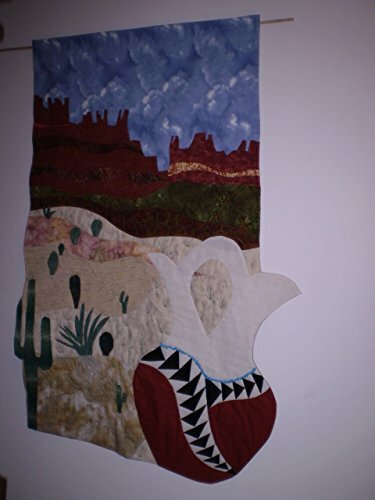 The Desert is heavily quilted. There is a rod pocket and wooden dowel provided to hang this piece. It is framed to the back with hand stitching.